There are many reasons why parents purchase an infant car seat cover. Below are some of the top baby car seat covers. 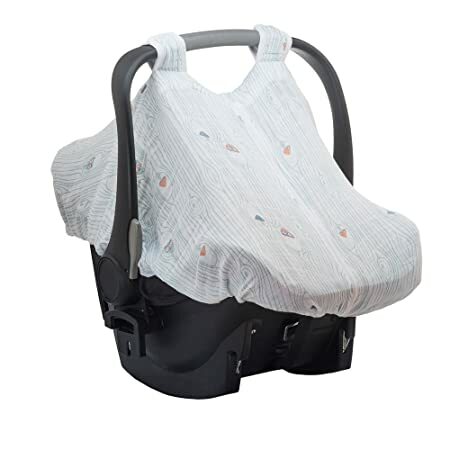 The JJ Cole Car seat cover for infants is one of the bestselling canopies.The fabric is 100% polyester. This cover is made of weather-resistant nylon and soft fleece, which will keep your baby warm and protected from rain, snow, wind, or hail. Its blanket-style design eliminates the need for bulky jackets. The cover features an elasticized band, which makes it easy to fit over your car seat or stroller. What makes this cover unique is the removable top flap that is used for temperature control. The flap can be completely zipped off in the event that your baby starts to get too hot. The fabric is 100% polyester and is also machine washable. If you will be carrying your baby around during the cooler months of the year, this car seat cover is definitely recommended. 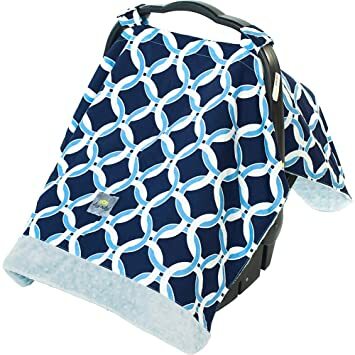 This Britax all-weather car seat cover is perfect if you are looking for an all-weather cover to keep your baby safe from various weather conditions. This cover provides sun, rain, wind and insect protection. When used for sun protection, the full coverage fabric is UPF 50+ and blocks 98% of harmful UV rays. For rain and wind, you can fold back the sun panel and a clear shield keeps your baby dry and comfortable. 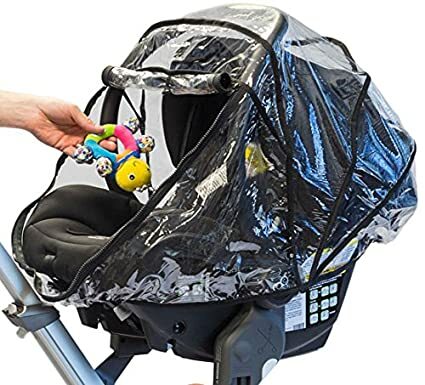 The shield also folds back to expose a large mesh window for increased ventilation and to keep your baby safe from bug bites. 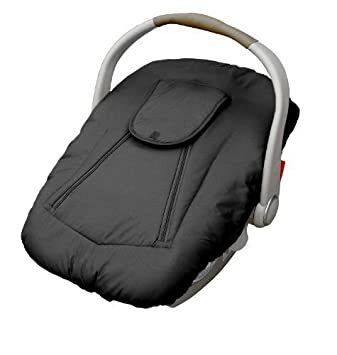 Although this cover is specifically designed to work with all Britax car seats by working with the existing canopy, it also fits most other major infant car seats brands. If you live in an area that experiences a lot of bad and unpredictable weather, this is a great option for you. This is one of the warmest car seat covers, perfect for winter. What’s unique about the Jolly Jumper Sneak-a-Peek is the built-in fleece-lined blanket inside the cover, shaped perfectly to swaddle your baby and keep him warm and cozy in cold weather. The materials used are high quality and the cover is machine washable. The cover is elasticized so it can easily fit over your car seat or stroller. It also comes with a built-in window so that you can keep an eye on your little one at all times. The outside of this cover is water resistant, making it a great option for rainy or snowy days. Their double zipper design on the top of the cover allows easy access for your baby to go in and out. This cover fits most infant car seats and carriers. 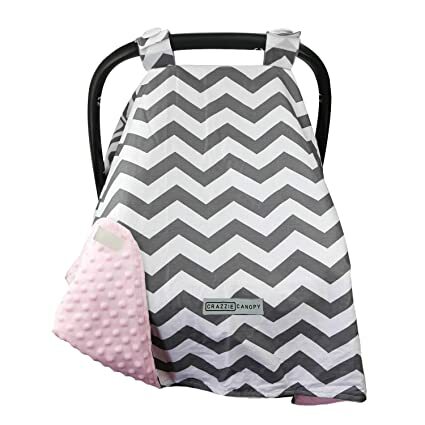 What’s great about this car seat canopy by Imagine Baby is that you can easily scrunch it up and fit it into any diaper bag. When the sun is out, you can simply remove it from your bag and place it over your car seat. The cover is made from a soft micropoly/lycra fabric and is breathable. It provides UPF 50+ sun protection and has water wicking capabilities, which cause it to dry quickly. There is a mesh window that allows you to check on your baby while keeping them protected. The Shade is a flexible fit and fits with most infant car seats. It attaches to the hood of the car seat and does not obstruct the car seat handle, so the handle is easily accessible. It is also machine washable. This inexpensive cover protects your baby from mosquitoes and insects. It is made of durable and breathable mesh with elastic edging for a snug fit. The cover has ventilation holes that allow fresh air to circulate. This cover fits easily over standard baby carriers and comes with a convenient reusable carry case. It is handy to have one of these covers close by, as you never know when you might need to walk through a buggy area with your baby! 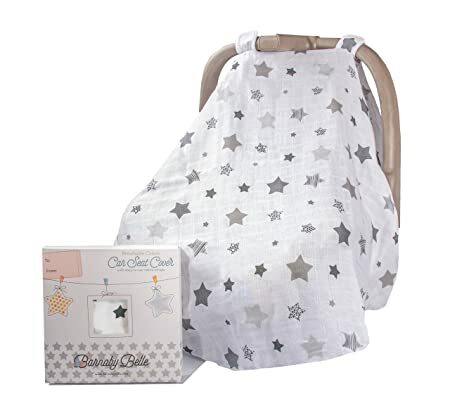 This lightweight Bébé au Lait Muslin car seat cover is ideal for humid days, shielding your baby from the sun and keeping him cool and covered. Made of premium open-weave cotton muslin material, this cover is one of the most breathable on the market. It is designed to create a light and airy layer to keep the sun and germs out. The zippered opening allows easy access to your baby, whether you want to take your baby out or just to peek at your little one. This cover is simple to install with its easy-snap straps and elasticized bottom that stays in place even in windy conditions. It fits most infant car seats and is machine washable. 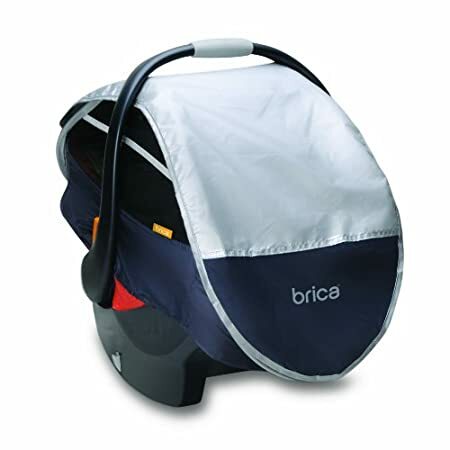 The Brica Infant Comfort car seat cover can be used on the car seat as well as attached to a stroller. Their retractable rain and sun cover is UPF 50+, meaning it blocks 98% of UVA and UVB radiation. The sun cover can also be used as a waterproof shield if you get caught out in the rain. 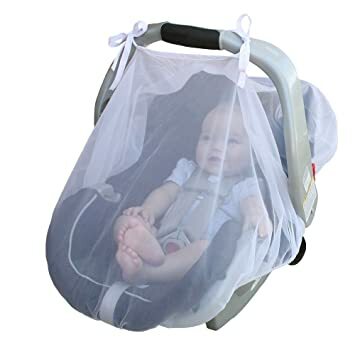 If you remove the sun cover, there is a mesh panel that allows your little one to see outside while still being protected from things such as insects. The mesh material provides ventilation, visibility, and privacy. Your baby can breathe easily and not get overheated. Both the panel and sun cover can be folded back on top so you can have sun coverage while having access to your baby. This convenient canopy installs easily, fits all major brands and includes a zippered carrying case for easy storage. If you are looking for a car seat cover that serves multiple purchases, the Kids N’ Such Premium canopy is perfect for you. The cover protects your baby from mild wind, cold weather, heat, sunshine or bright lights, rain, insects, germs, and more. It can also be used as a nursing cover or blanket for your baby. Simply remove the cover from the baby carrier and snap it around mommy like a bib while breastfeeding. This cover features a snap closure that lets you check in on your baby without having to lift the cover all the way up. There are also gaps between the snaps that let in fresh air, allowing your baby to breathe easily and not overheat. This cover should fit the majority of car seats and is machine washable. 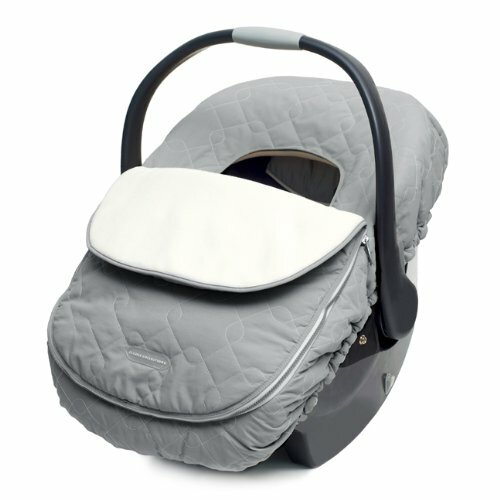 The Itzy Ritzy car seat canopy is reversible from lush minky to soft cotton and unfolds into an activity mat when you turn the cover over onto the plush fur side, perfect for tummy time, nap time, or diaper changes. The canopy has 2 interior hooks on each side to hang toys for your baby to play with while under the cover or laying on the mat. This 2-in-1 cover is perfect for keeping your baby entertained while shielding him from wind, sun, rain and germs. 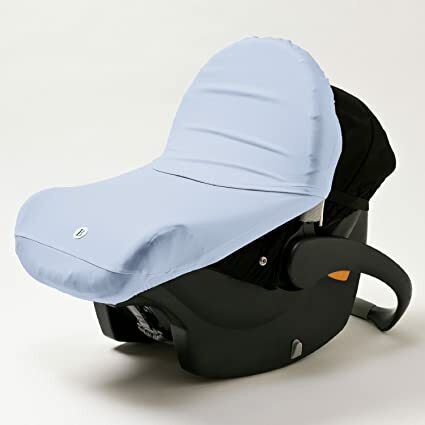 It will make traveling with your baby car seat more comfortable and functional. There is an opening at the bottom that allows ventilation and makes it easier to see the baby while carrying the car seat. The hook and loop closure makes the cover an universal fit that can be used on all infant car seat handles. It is also machine washable. 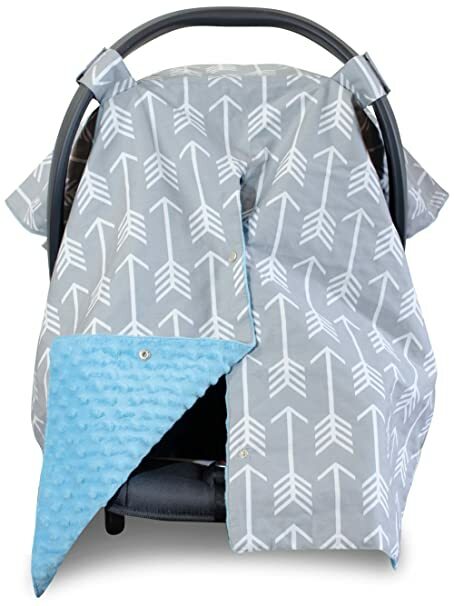 This stylish baby car seat cover protects your baby from germs, insects, and sunlight. This lightweight cover is made out of 100% muslin cotton, which makes it a breathable and cool canopy for your baby. The Barnaby Belle cover is an universal fit for all baby car seat models with its adjustable velcro straps. 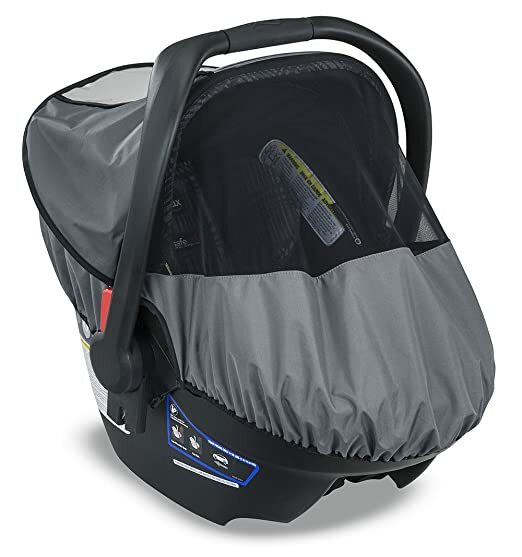 This extra large baby car seat canopy is perfect for tall babies who need extra leg room. The outside is made out of 100% cotton and the inside is made out of soft minky fabric. Unlike most car seat covers, this Crazzie canopy velcros to itself at the bottom to make sure it won’t flap up in the wind. It is machine washable. This Jolly Jumper Weathershield is one of the simplest car seat covers and does a great job protecting babies from rain, snow, sleet, and wind. It has ventilation holes for baby’s comfort and offers UV protection to prevent your baby from getting sunburned. The cover fits over most single strollers. If you are looking for a rain cover for a double stroller, consider the Jolly Jumper Travel System Weathershield. The only downside is that you have to completely remove the cover in order to access your baby. 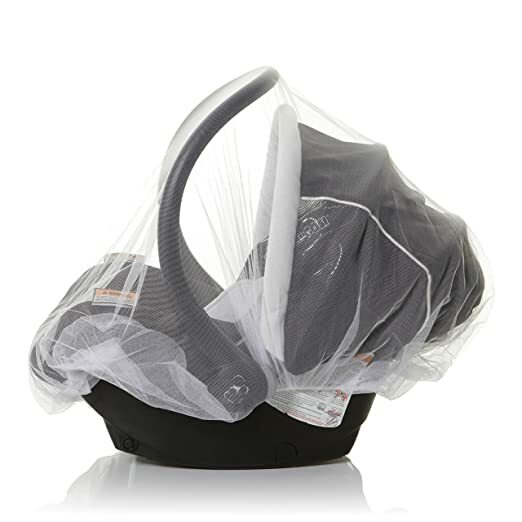 The guzzie+Guss Car Seat rain cover is a more expensive than the Jolly Jumper Weathershield but it has front zippers that allow you to access your baby quickly. This way, you do not have to remove the entire rain cover from the car seat just to check his diaper or put his pacifier into his mouth. The cover has ventilation holes for better airflow. It fits most major brands of infant car seats. 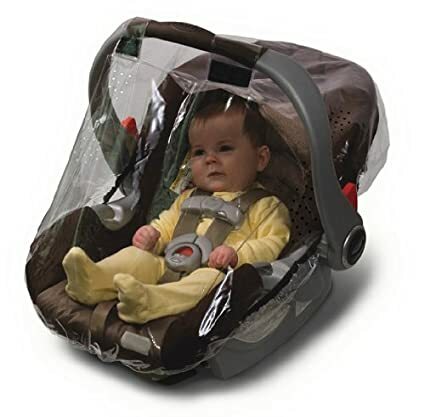 This breathable Jolly Jumper net protects your baby from insects and bugs. It is tailored with elasticized edging to fit all infant carriers and is secured by adjustable ties. The elastic edges prevent the net from sliding up and forming gaps for mosquitoes and flies to enter.